The Watlow® FIREROD® cartridge heater incorporates engineering excellence and is supported by almost 60 years of solid industry performance across a broad range of simple and complex applications. As the premier choice in swaged cartridge heating, thousands of industrial manufacturers continue to choose Watlow as their trusted thermal partner and certified cartridge heater supplier. to those set forth by leading standards and regulating industries. To meet our customer’s individual needs, there are many delivery options available for FIREROD heaters. 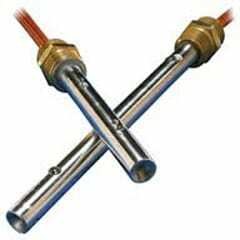 Tempco High Density Metric Cartridge Heaters have been widely used in many demanding and diverse applications for over 30 years. The commonly used basic applications are platen, plastic mold and die heating, liquid immersion and air heating. The Watlow® high temperature (HT) FIREROD® heater is specially designed for high temperature platen applications up to 1800°F (980°C). The HT FIREROD heater utilizes the same industry leading design principals used on all of Watlow’s FIREROD heaters. Taking the cartridge heater one step further enables the HT FIREROD to withstand application temperatures up to 400°F (204°C) higher than standard cartridge heaters. Watlow’s high performance FIREROD® has served the heater industry for over 50 years and a conduit box and wood handle has been added as a featured option. When inserted into a hollow bolt, the heater lengthens the bolt. It expands allowing the nut to be further wrench- tightened. The FIREROD bolt is then de-energized and removed. Upon cooling, the bolt contracts to a tight fit. TEMPCO Bolt Heaters are used as an aid to tighten large bolts in heavy machinery and equipment. Heaters are sized for easy insertion into a hollow bolt. The rapid heating of the bolt expands it, allowing further tightening of the nut. The heater is then de-energized and removed. As the bolt cools, its contraction back to original size provides a tight fit. 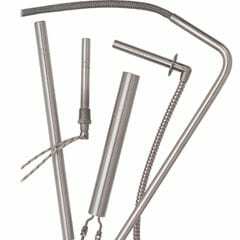 Tempco Bolt Heaters are constructed with one of the industry’s most efficient and highest quality heating elements—Tempco Hi-Density (swaged) Cartridge Heaters; with close tolerance fits, watt densities of 100 watts per square inch are obtainable—65% higher than standard cartridge or tubular heating elements can deliver. The higher wattage on Hi-Density Bolt Heaters means quicker heatup time and minimum heat loss to the area surrounding the bolt. 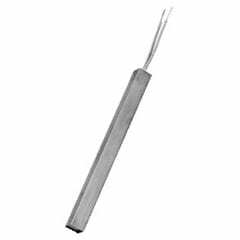 TEMPCO Low Density Square Cartridge Heaters allow more contact per linear inch than cylindrical cartridge heaters, for greater heat transfer to the surrounding medium. Inserted in a milled slot they permit greater heater lengths than would be possible with a drilled hole. 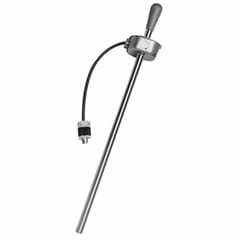 FIREROD® cartridge immersion heaters are ideal for replacing large screw-plug immersion heaters. The heater packages up to 300 W/in2 (46.5 W/cm2) in a compact unit, enabling a versatile heating system design. These heaters include a brass or stainless steel 3⁄4 inch National Pipe Thread Taper (NPT) double threaded fitting, which allows conduit boxes to be added. Also, FIREROD immersion heaters are sealed at the lead end with silicone rubber potting. 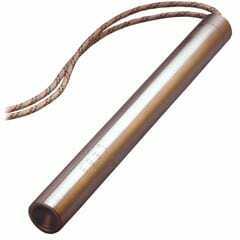 Solid copper leads with silicone rubber sleeves are provided for heavy-duty wiring. These units are recommended for immersion in water or 90+ percent water soluble solutions. 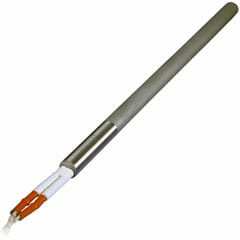 Hi-Density Cartridge Immersion Heaters are designed or heating water and other liquids. The high watt density capability of this heater permits greater heat dissipation in a given area than would a tubular immersion heater. However, it is important to note that allowable watt density depends on the material being heated. For water heating, watt densities, of several hundred watts per square inch are possible; while oil heating may be limited to 5 to 20 watts per square inch.